The life of a Strategic Space Sheep Commander isn''t easy, especially if that Commander is assigned to the Lambda Sector. All was well in the galaxy – until the first messenger ship arrived from a force that has become known only as "Wolf". Its language was unintelligible, but its message was clear: complete and total annihilation of Sheepkind. Soon after, the first Wolf ships arrived, laying waste to the satellite planets of the Sheep Home Systems. Front-line galactic defense forces were able to stave off further destruction – but what is coming is far, far more terrifying than any threat faced in the galaxy''s known history. All Systems have been placed under Red Alert, with the Strategic Sheep Command called together and a Flock Commander named. As members of Wolf have been spotted in Sheep Commanders'' uniform, SSC has determined that the best way of insulating the individual Systems is by outlawing all usage of the Spatial Sheep Distortion drives. Inter-system access is granted only to the Elite "Shepherd" class ships, via a complex network of Hyperspace travel. A fleet of these specialized ships has been assigned to recover the Sheeplings and return them to their Home Systems while the Wolf invasion is repelled. You are a Defender in the Strategic Sheep Command. You have trained all of your career for this moment in history. You know how to defeat Wolf – "Ewe''s The Force..."
Play any card face down to the Defense Mat. Additionally, a player may play a card matching the System occupied by the Wolf to attack (and knock the Wolf token on its side). 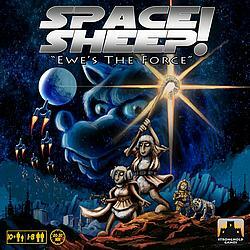 In Space Sheep!, one player acts as the Supreme Flock Commander, managing the one-minute sand timer. If the sand runs out, Wolf attacks and players must discard cards from the Defense Mat, the deck, or their hands; if they can''t, they lose the game. If the Wolf token has been knocked on its side, the Supreme Flock Commander may flip the sand timer before it runs out to avoid the Wolf attack, standing up the Wolf token and moving it to another System in the process. If players have found an Infiltrator, shuffle the player''s cards in hand and place them on the bottom of the deck. If players have found a Defender, place the player''s cards in hand on the face-down discard pile. On the ousted player''s turn, Wolf attacks. If the Defenders get all shepherds and space sheep to their matching systems, then they win the game. If the sand timer runs out and players can''t discard enough cards – or if the number of Infiltrators matches the number of Defenders in the game – then the Infiltrators win. Players can customize Space Sheep! by varying the number of Systems in play (more Systems = more complexity), the number of tactic cards in the deck (fewer cards = greater difficulty), the strength of Wolf, the ratio of Infiltrators to Defenders, and the types of direction cards (more directions = greater variability). One player acts as the Supreme Flock Commander, managing the one-minute sand timer. If the sand runs out, Wolf attacks and players must discard cards from the Defense Mat, the deck, or their hands; if they can''t, they lose the game. If the Wolf token has been knocked on its side, the Supreme Flock Commander may flip the sand timer before it runs out to avoid the Wolf attack, standing up the Wolf token and moving it to another System in the process. If the Defenders get all shepherds and space sheep to their matching systems, then they win the game. If the sand timer runs out and players can''t discard enough cards – or if the number of Infiltrators matches the number of Defenders in the game – then the Infiltrators win. Players can customize Space Sheep! by varying the number of Systems in play (more Systems = more complexity), the number of tactic cards in the deck (fewer cards = greater difficulty), the strength of Wolf, the ratio of Infiltrators to Defenders, and the types of direction cards (more directions = greater variability).